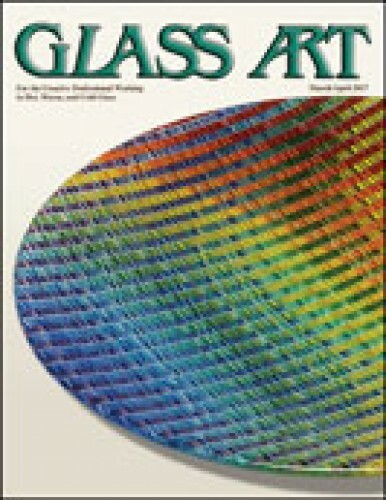 Glass Art editor Shawn Waggoner reminds readers of the many ways Glass Art helps glass enthusiasts learn and grow. Besides the informative pages of the magazine, there are interviews with renowned artists on the popular Talking Out Your Glass podcasts and Glass Expert Webinars™ for seminars with no traveling required. Judith Schaechter’s work gives voice to those who experience pain, grief, despair, and hopelessness, resonating with viewers and leaving a profound and lasting impression. In addition to using stained glass to express content typically associated with fine art, she revolutionized her craft through an inventive approach to materials. New York artist Nancy Gong is eagerly searching out commissions that stretch her boundaries in the design, size, and scope of projects, the environments where they are installed, and the techniques employed to make them. Her portfolio reveals her ability to discover design elements within the glass itself. The 2017 American Glass Guild (AGG) brings together leaders, practitioners, and wonderful people in Rochester, New York. Two days prior to the May 19–21 conference, AGG will be offering a wide assortment of impressive workshops. The main conference includes presentations on the work of Alphonse Mucha and others. Transparent enamels are a fairly recent innovation. Like the rest of the paints we use, they come in powdered form and are prepared for use by mixing with a liquid, usually water. It’s important to remember that they contain lead, which gives them their clarity, and must be used with caution. The Stained Glass School of the Stained Glass Association of America (SGAA) will be presenting a wonderful variety of professional classes in Durham, North Carolina, during the days preceding the SGAA 2017 Conference in Raleigh, North Carolina. 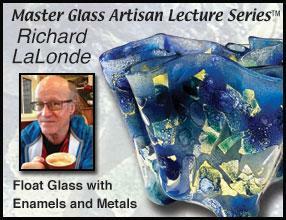 Classes will be conducted by renowned artists Steven Cowan, Jim M. Berberich, and Ralph Mills. J. Kenneth Leap has long been interested in education related to stained glass. His seven years as education chair for the American Glass Guild (AGG) have helped him realize his goal to develop lesson plans with glass for elementary and high school students, making them available to educators on the AGG website. In June 2016, the final pieces of Dana Boussard’s And you are the Branches were installed in Holy Spirit Catholic Parish in Great Falls, Montana. A decade of her work with project fabricator Dennis Lippert resulted in 40 panels of stained glass comprised of more than 16,000 pieces. Richard Parrish grew up in the American Intermountain West with big skies, endless prairies, and big buttes on the horizon. Despite years away developing an urban avatar, this landscape calls him back, infuses the artist’s kiln work, and is the source of his artistic inspiration. 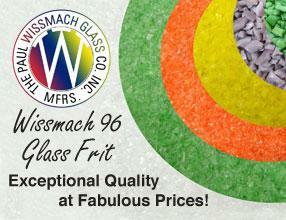 Functional fused glass helped Michael and Frances Higgins support themselves with their art and hands. Their successors, mother-and-son team Louise and Jonathan Wimmers, learned their craft from the Higginses and seek to balance the preservation of a legacy with the imperative to compete in an ever changing world of studio glass. Are You Aware of Current Trends? Keeping up with current trends in fashion, home decorating, jewelry fashion, and similar areas can help glass artists determine the best direction in which to take their designs. The computer is a good place to begin researching what is currently appealing to the public who make up their potential customer base. Kiln formed glass artist and U.S. veteran Jeffrey Stenbom has discovered that glass art gives him the ability to profoundly touch as well as express the experience of others, especially other warriors and their families. He sees the role that art has in healing and changing people’s lives. The Glass Art Society (GAS) has announced the 2016 recipient of its Lifetime Achievement Award, Joyce J. Scott, a mixed media sculptor who constructs sophisticated bead sculptures incorporating glass, clay, fabric, and found objects. Receiving the Lifetime Membership Award is Wayne Strattman, neon artist and developer of innovative lighting techniques for sculptures. Over the past 20 years, there have been many memorable events, including three exhibitions and an international conference in Bristol, England. Events are being planned to occur throughout the year to celebrate what has grown from a small group of enthusiastic glass artists to an organization heading toward 1,000 members.